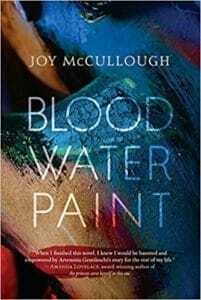 Blood Water Paint by Joy McCullough is one of the best written and best told stories that I’ve read in a long time. It is the story of Artemisia Gentileschi, a young painter in Rome in the early 1600s. It is a man’s world and women have little say in their own lives. Artemisia’s mother died when she was young and she grew up around her father’s painting studio. Her father, a painter of mediocre skill, has Artemisia grid the pigments for his paints and clean up the studio after him. Sometimes he makes her model for him. But Artemisia loves painting and has skills herself and understands that paintings can tell a story. Her father grudgingly lets her paint when there is time, but signs his name to her works. When she was growing up, Artemisia’s mother told her Bible stories featuring women. Artemisia realizes that her mother’s stories were filled with guidance for her on issues women face in a world controlled by men. These stories give her strength as she struggles to stay true to herself when put in situations beyond her control. The weaving of these stories from her mother in and around the events of Artemisia’s life is masterfully done and she uses them for inspiration and guidance. Blood Water Paint is based on the extensive archival materials about Artemisia Gentileschi, an actual baroque painter, and Joy McCullough brings history alive in its telling. I listened to the audio version of the story and Xe Sands did an excellent job in the reading. Highly recommended.